Building Information Modeling (BIM) is an intelligent 3D model-based process that equips architecture, engineering, and construction professionals with the insight and tools to more efficiently plan, design, construct, and manage buildings and infrastructure. Here at HLN Group we first adopted the use of Revit to support the BIM process during the acquisition of our engineering division, which importantly fully supports our multi-disciplinary design practice, capable of coherent and fully coordinated design. Through development and known working processes, HLN have been able to demonstrate to our clients a true model of their projects, which can allow access to all areas as they offer a great understanding of the actual ‘live form’. 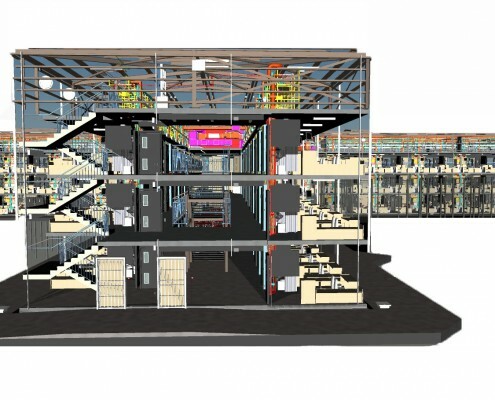 This proactive approach has led to clients embracing the benefits of BIM. The collaborative nature of 3D modelling and BIM allows, during review of the design stages, to resolve inconsistencies via a series of clash detection exercises utilising Autodesk Navis Works prior to any construction works, which in turn will lead to real time and material savings for the client. As a consequence of HLN’s commitment to BIM, we form part of the Ministry Of Justice (MOJ) workshop team who are investing and developing the BIM processes. This alliance allowed us to be designers of the first publicly procured BIM contract HMYOI Cookham Wood in Kent, which won a “Constructing Excellence in London and the South East Award” in the “BIM Project of the Year” category.